This week’s Digital Release Thursday pattern is the After-School Shirt + Pants. The pattern features a loose-fitting, pull-on shirt with long sleeves, a bateau neck, and a cute offset button detail at the front and back yokes. The pull-on elastic-waist pants include a separate side panel which allows for use of a contrast trim near the hem. An alternate view of the pants includes ruffle details at the front pocket opening and at the back. When Liesl originally designed the pattern, she intended it for girls. But after it was released, people began sewing it for boys. And you know what? It works really well, as you can see in this customizing post that Vivian contributed to the blog. 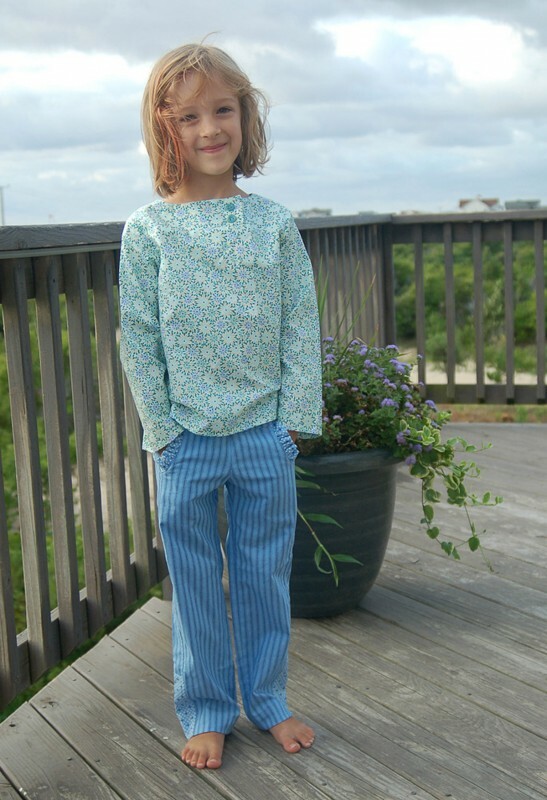 You can also find lots of photos of the finished top and pants in the blog post Liesl wrote to introduce the pattern.